Dentistry is changing about as fast as computer technology. We are shifting from an analog world, into a digital world full of options that weren't available ever before. 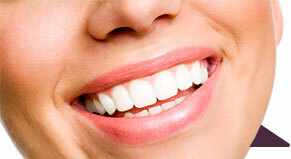 At Water Tower Dental Care in Chicago, we are able to simulate smile makeover outcomes, at a fraction of the cost. If someone was interested in enhancing their smile, we can take an oral digital scan (what you may remember as an impression using a tray and alginate) and digitally import the 3D rendering into a CAD/CAM (computer assisted design/machining) software. From there, we can digitally manipulate the shape of the teeth, and restore worn edges, correct rotated teeth, replace missing teeth, and close gaps just to name a few examples. Once the new smile is designed and overlaid the patients facial photo, we have the option to further make adjustments and modification with the patients input. Once everyone is happy with the digital simulation, we can 3D print the .stl file from the CAD software. We use this 3D print to shrink wrap the proposed smile enhancement on the patients teeth without needing to numb, drill or alter their existing teeth. The patient can go home for the a day and feel what it would be like to have their smile restored. 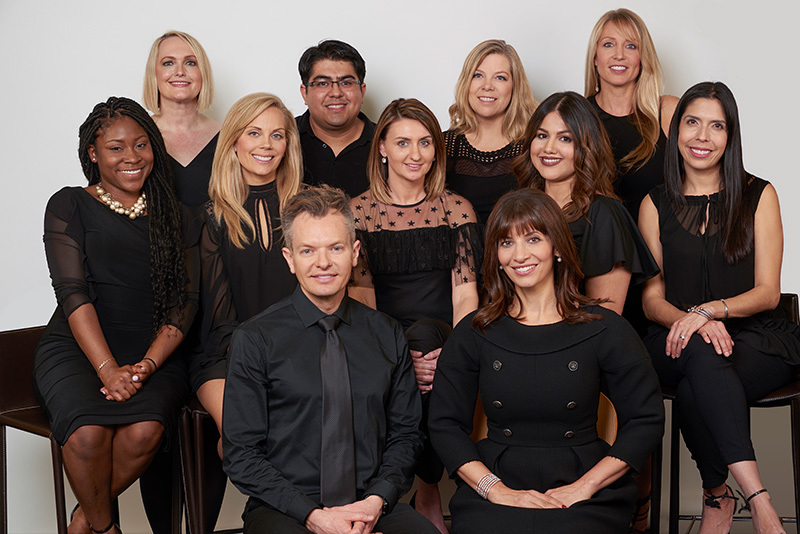 It's truly a conservative and non-invasive way to give patients a "trial smile' before they commit to treatment. If you are interested in being assessed for a trial smile, give Water Tower Dental Care in Chicago a call at 312-787-2131. We look forward to giving you the smile of your dreams. Just because the weather is getting colder and nights longer doesn’t mean you’re stuck inside the house until the springtime of 2019. 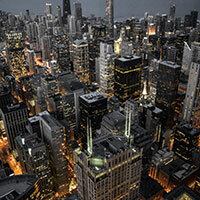 Chicago is a fantastic city with year-round entertainment and a plethora of fun things to do – even when Old Man Winter starts to drop the cold white stuff all over our city streets. Just because the temperatures have dipped below freezing and there’s snow and ice on the ground doesn’t mean that the city shuts down. In fact, it’s quite the opposite. Many fun winter-related activities will appeal to anyone willing to step outside their heated house or apartment and seek out adventure. As life-long Chicagoans, we’ve come up with our list of seven fun things to do in Chicago in the wintertime. Leave us a comment down below if you think we missed a must-see during these cold winter months. There is nothing more quintessentially Chicago than ducking into a coffee or hot chocolate shop then taking a nice winter stroll down Michigan Avenue. What’s the big deal about walking down a street, you ask? Michigan Avenue is home to the world-famous Magnificent Mile shopping district. This is the place to be for the quintessential Chicago wintertime experience. There are tons of shops, restaurants, bars, and even movie theaters you can duck into for an afternoon show. While Michigan Avenue can be enjoyed any time of the day, nighttime is when it comes alive. The streets, lampposts, and buildings are all decked out with seasonal lights, wreaths, and other holiday icons. If you look closely, you might even catch a glimpse of you-know-who as he’s making his list of who’s naughty and who’s nice. Lions and tigers and ice carvings, oh my! The Lincoln Park Zoo Lights Festival completely transforms Lincoln Park during the winter holiday season. With over 2 million lights strung up along the trees and ice carving demonstrations, carolers, and even a hot chocolate stand, there’s something for everyone here. No matter if you’re flying solo, on a date, or lugging the entire family, you’ll find hours of entertainment here. The Zoo Lights Festival is a great way to get yourself in the holiday mood and rub elbows with other holiday revelers. When: Evenings throughout November, December, and select dates in January. The world-famous Chicago Bulls have various home games throughout the winter season. If you search online, you can find tickets at a reasonable price. Or if you prefer to splurge, you can easily find courtside seats to watch the next Michael Jordan or Dennis Rodman play. Be sure to order your tickets asap as seats tend to fill up quickly. Parking can be a bit of a pain, but if you’re willing to get some exercise and walk a few blocks, then it shouldn’t be a problem. Bulls tickets can be purchased on many different websites, be sure you’re buying them from a reputable vendor. Some of the ticket scalpers that stand outside of the stadium will sell fake tickets that won’t allow you admission when they’re scanned. Another iconic wintertime Chicago activity is renting a pair of ice skates and taking a few laps at the McCormick Tribune Ice Rink in Millennium Park. You’ll get a first-hand view of the amazing Chicago skyline in the wintertime. Guaranteed to put anyone in the holiday spirit, ice skating is a fun way to kill a few hours in the day or night time. The cost is free, but keep in mind that the park gets packed on the weekends and certain nights. Skate rentals start at $13, and locker rentals can be had for only $1. We’ve chosen to include Maggie Daley Park Skating Ribbon on this list because of their unique ice-skating rink. Unlike the McCormick Tribune Ice Skating Rink which is in the shape of a big oval, the Maggie Daley Park has an actual ribbon to skate!!! Imagine a freeway where no cars exist, and the entire ground is covered in freshly Zamboni’ed ice. At the Maggie Daley Park, you’re going to be ice-skating down a ribbon of road that is around twice the length of a standard ice rink. You’ll feel like you’re seeing the entire Chicago skyline as you traverse the skating ribbon. There’s nothing like it anywhere else in the world, and this is why we’ve chosen to include it in our top five list. Unlike most cities in the wintertime, Chicago never shuts down. You’ll find something for everyone here. Just be sure to check the weather and dress appropriately because when the temperatures start to dip below freezing, and a cold wind starts kicking off Lake Michigan, things can get real cold, real quick. It’s no big secret that brushing and flossing your teeth on a daily basis can help prevent all sorts of oral diseases such as gingivitis and tooth decay. Why then have tooth decay rates amongst adults risen over the past five years? Our diets tend to consist of large amounts of sugar – even in things you would typically think are healthy such as apple and orange juice. These sugars will cling to your teeth and provide a literal Vegas-style buffet table for bad bacteria that can lead to tooth decay or other oral diseases. In addition to high-sugar diets, lack of dental maintenance also plays a significant role in the rise of tooth decay incidents in adults. Brushing and flossing alone are not enough to maintain a healthy mouth. It’s highly recommended you visit a dentist at least once a year for a full dental cleaning that can clean hard-to-reach areas that regular brushing and flossing cannot. We’re going to look at what tooth decay is, how a dentist will determine if you have it, and the five stages of tooth decay. Tooth decay is as it sounds. It’s the decay or rot of the various materials that make up your teeth. It’s caused by high levels of bacteria that feed off of the sugars, food scraps, and other organic material on your teeth and gums. 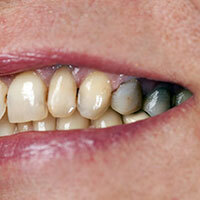 If left unchecked and untreated, your teeth will start to rot, then fall out of your mouth. Dentists have identified five different stages of tooth decay. The good news is that if the dentist catches your tooth decay at an early stage, it can be reversed entirely. To diagnose tooth decay, your dentist will ask you a series of questions as they examine the inside of your mouth. Do you have any tooth pain? Can you eat or drink hot/cold foods without pain? The dentist will be probing your teeth with dental instruments to check for soft areas that could indicate tooth decay. An X-ray or two might be taken to confirm their suspicions. Once the dentist has evaluated the overall state of your oral health, they will then let you know if you have tooth decay as well as the extent of it. The good news is that the early stages of tooth decay can be treated with a wide variety of treatments including enamel remineralization treatment. There are five distinct stages of tooth decay. Each stage can be viewed as a sort of proverbial cliff. Once you fall off the edge, you’re in the next stage of decay. It’s a useful tool that dentists can use to create a triage for your teeth and help stop the rot from progressing any further. In the first stage of tooth decay, teeth will show signs of a sustained attack by bacteria. Little white spots will appear just below the surface of the enamel. This is indicative of a process called “demineralization,” which is the loss of essential minerals that help make your teeth healthy and white. The good news is that if the dentist catches tooth decay at this early stage, it’s completely reversible. Treatments can include fluoride treatments which can help prevent demineralization from occurring. In this stage, the tooth enamel will show clear and visible signs of decay. Your teeth are now under full attack from bacteria. Teeth will erode from the underside outward which means that you may not notice it until it’s too late (a dental checkup would easily catch it). This means the outer enamel will look completely normal until the cavity has grown in size that it will break through the surface of the enamel. At this point, there is no turning back. A dental filling will need to be performed to prevent further decay. When most people come to the dentist with a toothache, they’re usually in or very close to the third stage of tooth decay. The cavity will begin to eat away at the 2nd protective layer of the tooth, the dentin. At this point in time, the dentist will recommend an immediate filling to prevent the cavity from breaking the third and final defense of the teeth: the pulp. The bacteria in your mouth think of the pulp inside your teeth as a delicious chocolate cake. They will stop at nothing to get to that sweet, juicy, and delicious tooth pulp. While the bacteria in your mouth are having a lovely banquet, the pain you’ll be feeling will be quite considerable. At this particular point in time, a dental filling will no longer work, and it’s time for a root canal. This is the only way to save the tooth from having to be extracted. At this point in time, the infection has reached the root of the tooth and exited the tip of the structure of the tooth. If left untreated, the infection can spread to the gums, jawbone, and even other teeth. The patient will experience significant swelling and pain. A root canal might save the tooth, but most dentists will often recommend a complete extraction. Tooth decay is a serious medical condition and can lead to other health complications such as infections and even bone loss. This is why it’s so important to not only brush and floss twice a day but to make it a point to see a dentist once a year for a dental checkup and perhaps a deep cleaning. Water Tower Place is located smack dab in the middle of the Magnificent Mile, a 13-block stretch of businesses, entertainment, and cultural places of interest. It is the premier commercial district in downtown Chicago and home to many upscale luxury boutiques, fashion outlets, restaurants, and hotels. Water Tower Dental care resides in the 72-story skyscraper that makes up Water Tower Place. Native Chicagoans know this is the place to be or go when you want to see and be seen. No matter your tastes or interests in life, there is a little something for everyone at Water Tower Place. We’ve compiled a little guide to Water Tower Place, and we hope you will find it useful and helpful. Don’t forget; you can always schedule a teeth-cleaning appointment with Water Tower Dental Care in the morning and be shopping in the many stores by early afternoon. Water Tower Place is named after – yup you guessed it --- an old water tower that was built in the heart of downtown Chicago in 1869. The primary purpose of the tower was to draw clean water in from Lake Michigan to serve the needs of both Chicago residents and the firefighting departments alike. The Great Chicago Fire of 1871 saw almost the entire downtown Chicago go up in flames. The water tower was one of a handful of buildings that survived the devastation. As the years turned into decades, the city of Chicago retrofitted and renovated the tower to upgrade it to modern construction standards as well as to clean over a century of dirt and grime off it. Water Tower Place came into existence in the 1960’s, and the skyscraper where the offices of Water Tower Dental Care resides was built in 1975. Over the next 40 years, subsequent developers began building up Water Tower Place. Known for both its middle-class and luxury shops, it is a Chicago icon that has continued to evolve and grow over the decades. The shops at Water Tower Place are a destination for many Chicago residents and out-of-towners. The vast majority of the shops are contained within an 8-story mall. Over 100 retailers, restaurants, and entertainment venues are located within the building. If you’re visiting Chicago, there are many hotels scattered throughout the Miracle Mile area. They range from 4-star luxury hotels to your basic run-of-the-mill B&B. Without a doubt, the most prominent hotel in the area is the Ritz-Carlton. They opened a hotel in the tower in 1975, and it’s grown into a 435-room local landmark. Renting a hotel room in the immediate area can be somewhat pricey. You can find deals by visiting one of the many travel and deal websites. Sometimes the hotel(s) have extra rooms in their inventory and will run promotions to fill them up. O’Hare Airport is just a 35-minute short drive away, making the hotels in the area very accessible to tourists. If there’s one thing Chicago is famous for, it’s our love of food. In the mall, you’ll find your usual stores such as Starbucks and Auntie Anne’s Pretzels which can satisfy your food cravings until it’s time for dinner. Harry Caray’s, M Burger, Mity Nice Bar & Grill, and Wildberry Pancakes make up the bulk of the sit-down food establishments inside the mall. If none of the above tickles your food craving, step outside, and you’ll find one of hundreds of local restaurants, pizza joints, and libation establishments. Protip: If this is your first time in Chicago, make it a point to visit Pizzeria Due which is a Chicago icon. On their menu is a mouth-watering deep-dish pizza that will have you licking your fingers afterward and planning a 2nd trip back to Chicago to eat more deep-dish pizza. 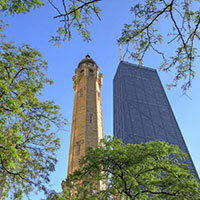 It’s located just seven short blocks from Water Tower Place. A mall isn’t a mall without entertainment and Water Tower Place doesn’t disappoint. If you visit their website, you’ll find a list of events and upcoming attractions. At this time of year, all eyes are on Santa Claus himself, and he’s already confirmed his appearance at the mall (assuming his reindeer don’t break down on their way from the North Pole). Take the little ones to sit on Santa’s lap while you enjoy a Pumpkin Spice Latte or other seasonal beverage from one of the many cafes and restaurants located in the mall. The mall also has an app you can download which will keep you abreast of any upcoming events. They also offer free Wi-Fi while you shop (you’ll need to sign up for their emails first). If you’re looking for a great way to kill a few hours, Water Tower Place is the place to be. Whether you’re flying solo, with your significant other, or heading up a caravan of children, grandparents, and out-of-state relatives, Water Tower Place has something for everyone. If you find yourself in the area, be sure to stop by our offices, say “Hi!” and make an appointment for your teeth to be cleaned. The holiday season is rapidly approaching, and all those sweets, candies, and sugar-laden holiday foods can leave a nasty layer of plaque all over your teeth.